Without a qualitative VIP platform well adapted to the event and to the client's needs, an event will not be considered as successful. GPS Performance provides you with its experience and network in elaborating, commercialising and coordinating public relations programmes. The beautiful lakeside city of Geneva will host the newest event in world tennis, the Laver Cup from September 20th-22nd 2019. 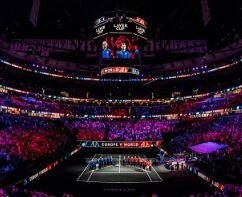 The Laver Cup is an international indoor hard court men's tennis tournament between two teams: Team Europe and Team World. Each team is comprised of six players, and led by a team captain, who is a legend of the sport. The captain of Europe is Bjorn Borg, and the captain of Team World is John McEnroe. Roger Federer and Rafael Nadal already confirmed their participation for this third edition of the Laver Cup.